Few Americans have been so honored by their country that their remains have been buried in the middle of the most famous street in America in their own personal cemetery. William Jenkins Worth can say that. According to Roadside America, Worth’s is one of only three private graves in all of New York City. Although exactly why he’s been singled out with this particular honor is a bit obscure. Worth Square, next to Madison Square and just feet from the Flatiron Building, is one of those odd traffic islands that’s hardly a place of peace and repose. Broadway and Fifth Avenue rush by on either side and the traffic of 23rd street hurls by on its south side. But it’s here that a monument stands in honor of Worth, a general in the oft-forgotten Mexican-American War, which won for the United States the state of Texas and, eventually, President George W. Bush. 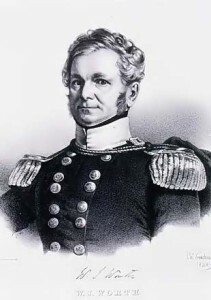 Worth served admirably in many battles of the conflict, becoming the first general in American military history to engage off the shores of Veracruz in ‘amphibious warfare’ — namely, the strategic usage of approaches from the water to engage in combat on land. In 1847 he also personally hoisted the American flag above the palace in Mexico City after the US’s victorious conquest there. Within two years he would be dead of cholera, transported to Brooklyn and buried in Greenwood Cemetery, the hotspot for dead celebrities in the 19th century. 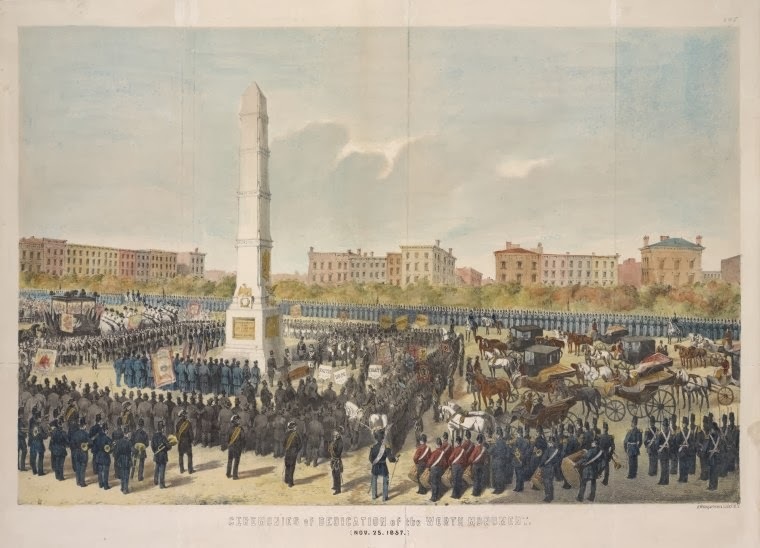 A few years later, he was dug up, brought to Manhattan, and buried at this unusual spot underneath an impressive obelisk designed by James Batterson (later to be the go-to guy for Civil War monuments). 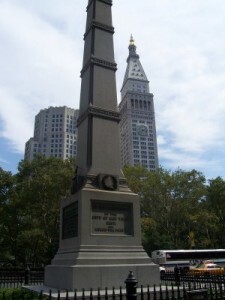 Forgotten NY says that the iron rod gate surrounding this solemn monument is a revered example of iron craftsmanship. 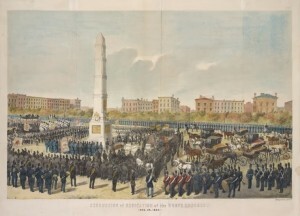 Worth’s remains were placed here in a solemn ceremony on November 25, 1857, involving almost 6,500 soldiers in march. Etched upon the monument is a listing of all the many battle Worth fought in. — Worth served under then-general Zachary Taylor at the start of the Mexican-American War. By the time Worth died, Taylor was the President of the United States. Certainly some political favoritism was at play. — The monument’s location was considered peaceful at one time. Adjacent Madison Square opened two years prior and the building boom that would give us Flatiron, the Met Life Tower and the other beautiful buildings surrounding the park wouldn’t occur for decades. The obelisk would have towered over everything. It would have truly been a sincere honor to be placed here. The respect New Yorkers had Worth extended downtown to Worth Street, which was, incidentally, one of the five streets intersecting to create the notorious Five Points district. 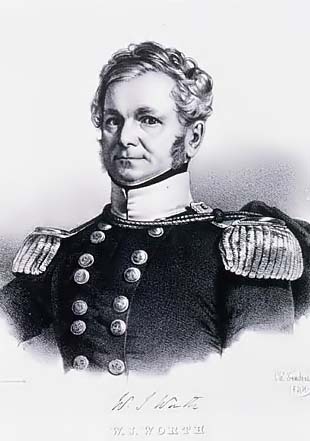 Another of the Five Points intersection streets — Baxter Street — is named after Charles Baxter, who died in the Mexican-American War. Another example of a well-meaning gesture of honor distorted by the realities of urban growth.